Daft Punk made their first public outing since the release of ‘Random Access Memories’ yesterday in support of their personalised race car, which was competing in the Monaco Grand Prix. 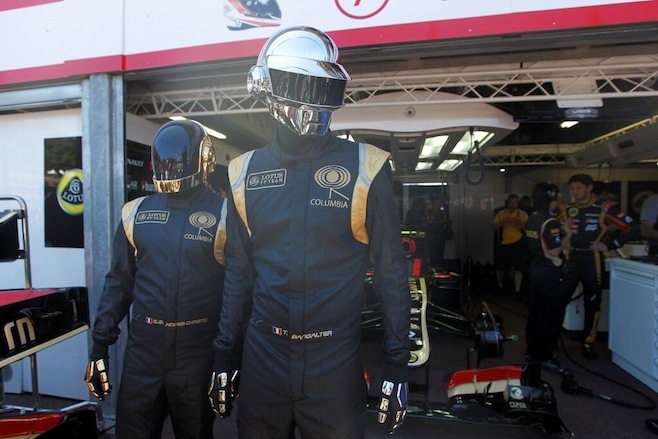 Following the announcement that last week’s NME cover stars would put their name to the vehicle, which was being raced by Britain’s F1 Lotus team and was adorned with imagery based on the group’s aesthetic, Daft Punk put in an appearance at the sporting event, wearing full costume including their traditional helmets. The Twitter page for Lotus F1 was full of photos of the duo attending the race (scroll down to see), whilst the account also posted a link to a DIY cut-out kit to make your own Daft Punk characters. Earlier in the week, meanwhile, it was confirmed that ‘Random Access Memories’, which was released on Monday, is the fastest selling album of the year, with sales hitting 133,000 within the first four days. The record is set to debut at #1 this evening when the official album charts are announced, whilst it’s expected that ‘Get Lucky’ will be knocked from its perch at the top of the singles chart by Emeli Sande’s producer Naughty Boy and his track ‘La La La (feat Sam Smith).